Before noon, Saturday, the National Disaster Risk Reduction and Management Council clarified the official death toll from Tropical Storm #MarioPH was not seven but five. As radio dzBB’s Rowena Salvacion reported, Alexander Pama, NDRRMC executive director, apologized for what he said was a lapse on the agency’s part. However, it was not immediately made clear who among the casualties identified in NDRMMC’s 8:00 a.m. update did not belong to the official list, which also indicated that one more individual is still missing. NDRRMC’s corrected report indicated seven, and not six, people were injured in Mario’s wake, also according to dzBB. Erlinda Cereno, 69; Tomas Barol, 31; Althea Gaviola, 2; Javier Jevania Mateo, 1. Ernesto Guevarra,55, is still missing. NDRRMC also mentioned in its 8:00 a.m. update that 118,839 families or over 530, 438 people were affected by the storm’s passing in Ilocos, Central and Southern Luzon, Central Visayas, Cordillera Region and Metro Manila. 93, 062 people from 23, 581 families that were affected are moved into 181 evacuation centers. 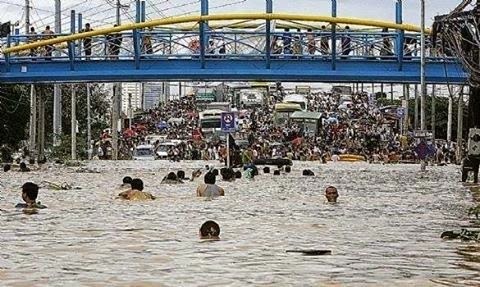 Some 300 areas in Ilocos, Central and Southern Luzon, Bicol and Metro Manila still remains flooded as of 5 a.m. Saturday. In Cagayan Valley, Central and Southern Luzon, Bicol, Western and Easter Visayas and Metro Manila, some 87 roads and five bridges aren’t passable. As Tropical Storm Mario intensifies slightly, it moved toward southern Taiwan before noon Saturday. Even so, PAGASA states that storm signals were still raised in seven areas. Mario is also said to be expected to leave the Philippine Area of Responsibility in by Sunday evening according to PAGASA’s 11 a.m. advisory. It is said that Mario was estimated at 143 km north-northwest of Laoag City, with minimum winds of 105 kph near the center and the gustiness up to 135 kph as of 10:00 am. Projected to move north-northeast, Mario goes at 15 kph and will be at 244 km north-northwest of Itbayat, Batanes Sunday morning. The storm is expected to be at 676 km north-northeast of Itbayat by Monday morning, outside the Philippine Area of Responsibility. Mario may still bring rainfall of 7 upto 20 mm per hour (moderate to intense) within its 350-km diameter according to PAGASA. Along with the Southwest Monsoon, Mario will bring moderate to strong winds over Bataan, Zambales and the rest of Northern Luzon. This may have moderate to occasionally heavy rain and thurderstorms which may trigger incidents like landslides and flash floods. Meanwhile, in Metro Manila, Calabarzon, Mimaropa and the rest of Centra Luzon, it is said that these areas will have occasional rain. The fisherfolk and individuals with small seacraft are also reminded by PAGASA not to venture out over the seaboards of Luzon.